sry my bad forgot to refresh the site, was prolly still saved in temp files or something. it's there now so ignore my prvious post pl0x thanks! You know the bloodreaper rune talents? No, I don't know. If there are complete and accurate data about the runes, I can add them. thanks for update on Bloodraider! FW should give this guy some rewards for hardwork, shame on FW >.< can't update their own game. Apparently I'm the god of K-pop... ._. To all. Please rebuild talent trees in your forum topics. Old links don't work. This would be cool. Adding the Rune to this. Just an idea. How about making the talent calculator updated with possible rune talents too? It would make the site much better than the other talent calculators for making your talent and rune builds. And when the new lv90 patch comes, I hope you will keep updating it to add new talents. Please give a visual example. Eviscerate and Hell Chant (Elf, bard, water) both say sonata of water, needs changed to Frozen Fugue. Friends, please vote my manual in Steam and leave a comment. I updated the first post and wrote a simple manual. First of all, thanks a lot for taking the effort of making this. I just wanted to point out that as of Blood Harvest, the cast time for Burning Rage (Burst MM skill) has been reduced from 2 seconds to 0. I'm not burst myself but a friend pointed out it's actually 0.5 seconds cast, despite the description saying otherwise. Adding a pop up window or a toggle tooltip, when you click on a tree for each class, that shows the all the rune power skills (not the % cast time ones but the special ones) for that tree. 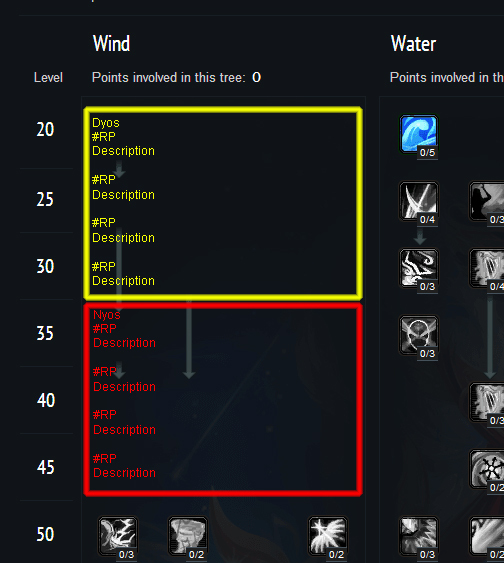 For example, for wind bard, when you click on "wind" it'll show all the nature ones (both dyos and nyos). Something like this for a tool tip. Since some skill descriptions are long, a toggle tooltip might work better than a mouseover, especially for people on a smaller screen (laptop). Then you just click "wind" again and it goes away. As you can see, with 4/4 Break Soul, the pet does 4234 / 3650 = 1,16 = 16% more dmg. Thats 8% base from Soul of the Land + 8% from 4/4 Break Soul talent. This isn't really an issue with the talent calculator, its an issue with the in-game talent description. any idea why i cant open this website fwcalc.com ? did you try this link?